A modern twist to a classic ornamental grass. Striking deep burgundy purple foliage that explodes like a firework from the ground! Red bottlebrush flowers appear in later summer. Perfect in pots, containers, beds, borders and even rockery or gravelled areas. Supplied as a 2L potted plant ready to plant out. 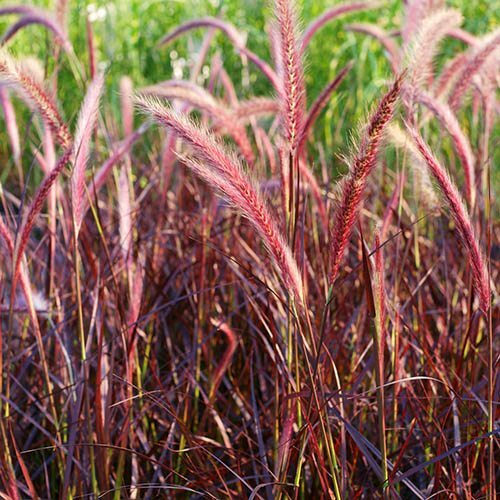 A modern twist to a classic ornamental grass, the Pennisetum 'Fireworks' has a striking appearance with its deep burgundy purple foliage that explodes like a firework from the ground! Known as the first 'purple fountain grass', it's long leaves spill out just like water trickling from a fountain. The variegated leaves really are the main attraction and can't be missed in pots and containers on the patio, but will stand out just as proud in beds and borders - especially in rockeris or gravelled areas. Unique red bottlebrush flowers will appear later in the summer that will gradually fade in colour. A spectacular, showy garden perennial with year round interest, Pennisetum 'Fireworks' is a cracker for any garden. Supplied as a 3L potted plant in a protective nursery pot, ready to be re-potted or planted out.